Every genre has two ingredients that got them started: a first game that brought all the ideas together, and a big non-gaming influence. The FPS had Wolfenstein 3D and Aliens. The RPG had Ultima and either Dungeons and Dragons or The Lord of the Rings. The battle royale had DayZ and, er, Battle Royale. However, only one genre had the influence become the first game – the RTS. 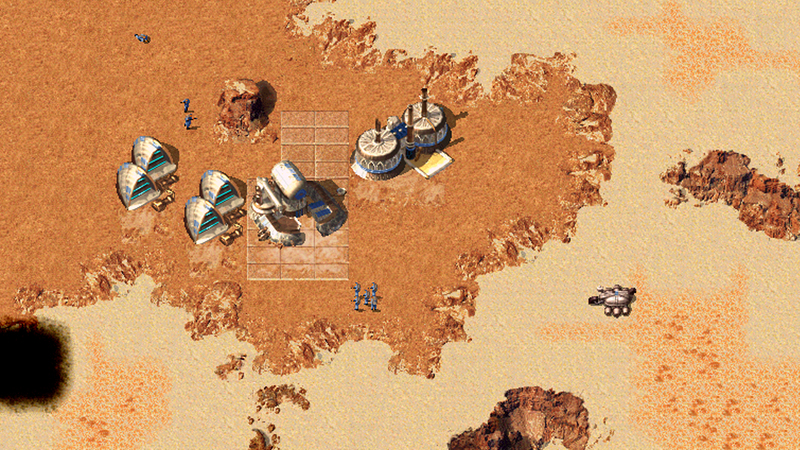 Despite earlier strategy games such as Herzog Zwei having real-time elements, it’s widely acknowledged that 1992’s Dune II: The Building of a Dynasty (or The Battle for Arrakis) from Westwood marks the point where all the core concepts, mechanics, and ideas of the genre truly came together.. Westwood then went on to polish the Dune 2 formula and create Command & Conquer. 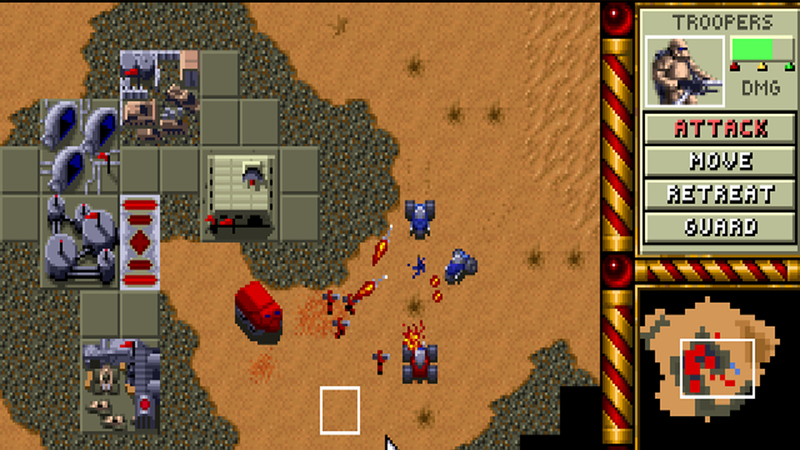 Yet, what made Dune 2 such a great adaptation was that all of its elements were already in the original novel – and as such, Frank Herbert’s Dune is the true template for the RTS genre. If you don’t know Dune, it’s an epic sci-fi novel from 1965. It’s had a 1984 David Lynch movie, a miniseries, and a new movie directed by Denis Villeneuve is coming in 2020. It’s had a few videogames too, most notably Westwood’s Dune 2 – plus the Dune 2000 remake – and Emperor: Battle for Dune. It tells the story of two great houses, Atreides and Harkonnen, warring on the planet Arrakis, aka Dune, over the valuable resource known as Melange. 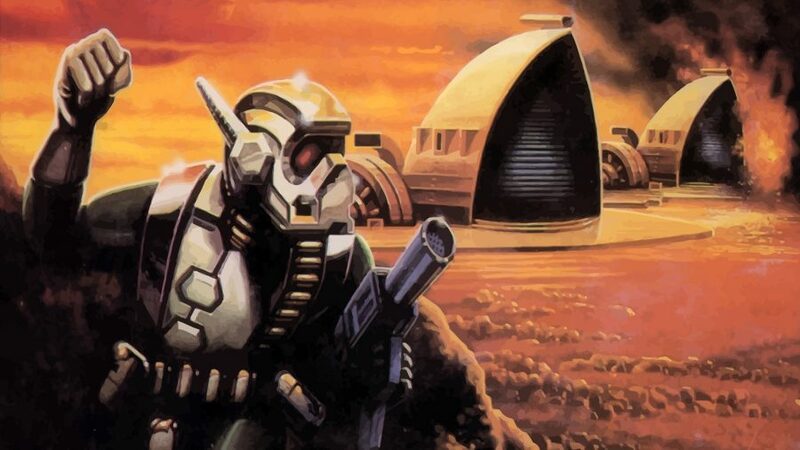 Westwood took a lot of what made the novel great when it made Dune 2, with its only real embellishment being the addition of a third faction – the creepy House Ordos. Going back to the original book today, it’s surprising how much of what made Dune 2 such a compelling strategy game was lifted directly from it, and how many of those ideas can still be found in basically every RTS today. Multiple unit types with specific abilities or weapons, rather than just soldiers, special units unique to each faction, a range of vehicles with both ground and air units – but no starships, despite being a space novel. Even small details we take for granted in strategy games – like being confined to a specific battleground, and not being able to nuke the entire map – are given in-canon explanations in Dune. StarCraft doesn’t have that. Total War doesn’t have that. You can even spot cool ideas that didn’t really appear in the RTS until after the Command & Conquer years. In Dune, the Harkonnen ally themselves with the Imperial Sardaukar to help win the first big battle, and the Atreides get help from the Fremen faction to beat the Harkonnen and conquer Arrakis. These are, essentially, the smaller non-playable factions that you can ally with to gain either unique unit types or a special bonus in more recent RTS games. Like the Sartes and Carnutes in Total War: Rome 2, or the Nilari Cultists and Viturak Cabal in Sins of a Solar Empire: Rebellion. However, what makes Dune different from any other book or movie about war – and the real proof of why it’s the heart of the RTS genre – is the reliance on gathering a vital resource. The armies in Apocalypse Now or Star Wars don’t stop in the middle of a battle to think ‘we better gather some Tiberium or we won’t be able to afford more troopers’. Conan Exiles developer Funcom recently picked up the Dune IP and is working on at least three Dune games, including an ‘open-world multiplayer’ title. Could one of the other two be an RTS? Well, Funcom is already working with Petroglyph - which has several Westwood veterans, including Dune 2 designer Joseph Bostic - on Conan Unconquered. It’d certainly be the perfect team to helm a new Dune RTS. The spice Melange is the whole focus of the wars in Dune, and no matter how bad the fighting gets, the resource must be gathered by any faction who wants to succeed. The spice must flow. Even the name ‘harvester’ for a resource gathering unit comes from Dune. So let’s have a quick summary of what’s going on in Dune II. A valuable resource that needs to be gathered and sold to make money, along with specific resource gathering units that need to be protected. Technologically advanced armies with multiple unit types, even among common soldiers. Named hero units. Being confined to a single battle area. Gathering the support of smaller factions for bonuses. Devastating superweapons, but not ones that will destroy the battleground. 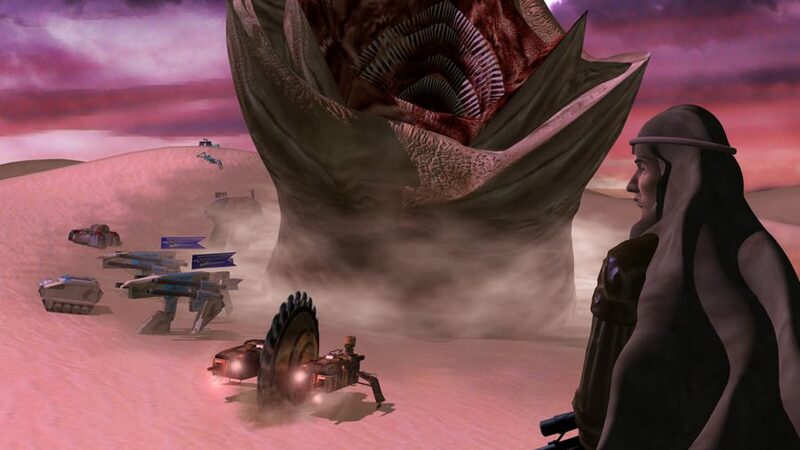 Wildlife or forces of nature that threaten all factions – never underestimate the sandworms of Dune. These features are the concrete slabs that form the base for basically every RTS, and all were introduced to them and given canonical explanations for them in Frank Herbert’s Dune. While Westwood was the cunning developer that thought ‘this Dune thing would make a heck of a strategy game’, the novel provided the team with everything it needed. An entire genre was born on the sands of Arrakis. Not bad for a book that came out seven years before Pong.